Serene, unique, cozy and comfort-inducing are all words used to describe the rooms available at Rio Villa Beach Resort. 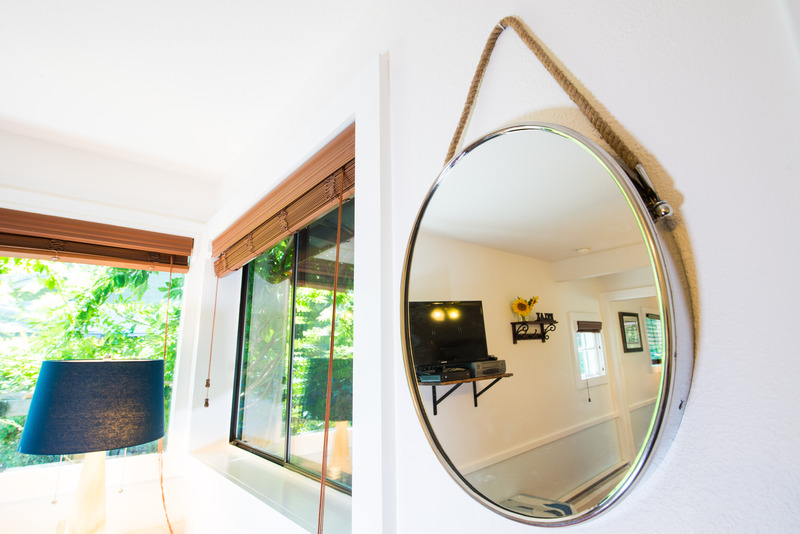 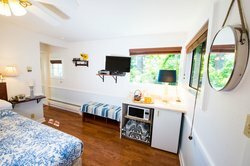 Appointed with thoughtful amenities and unique features, each of our rooms possess a different personality and different design but all the same commitment to hosting you and your Monte Rio getaway memories. 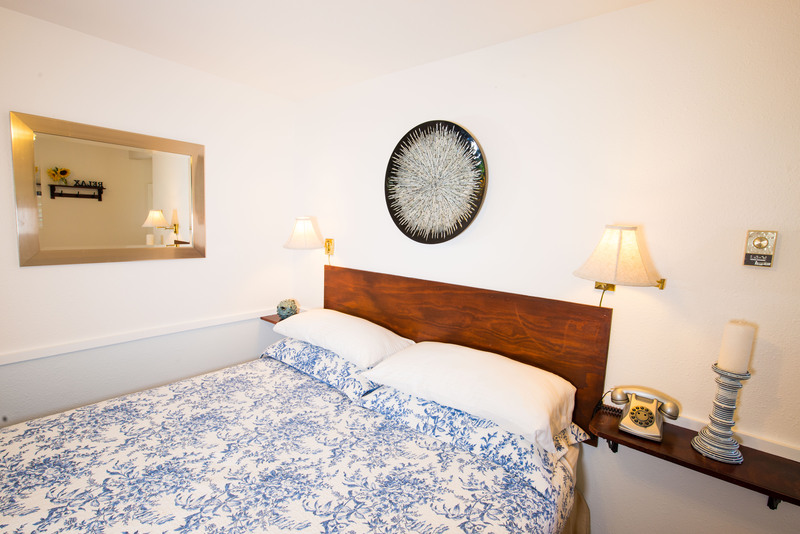 Each of our rooms is designed to inspire, with nods to nature, quiet comforts and small luxuries. The starting rates are ideal for budget conscious travelers and start for 1 & 2 guest occupancies. 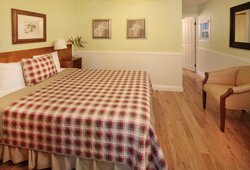 Each additional person stayin in the room is charged $25 per night, including children ages 4 and up. 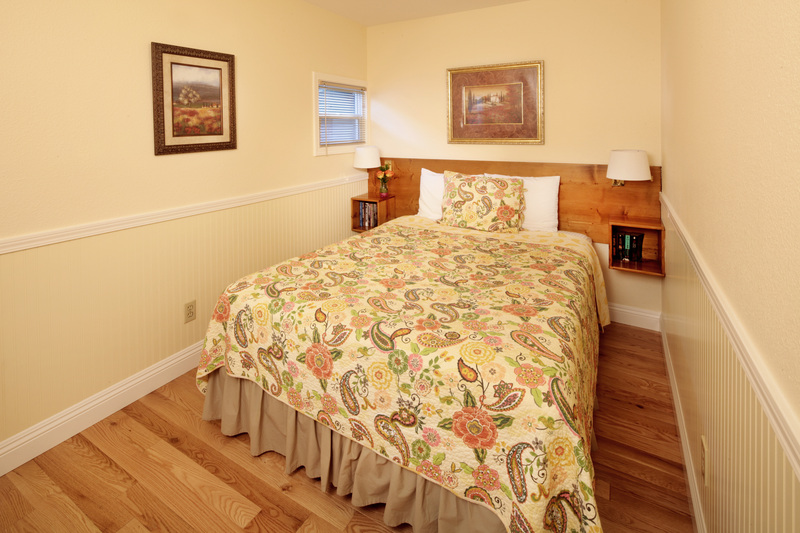 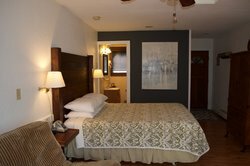 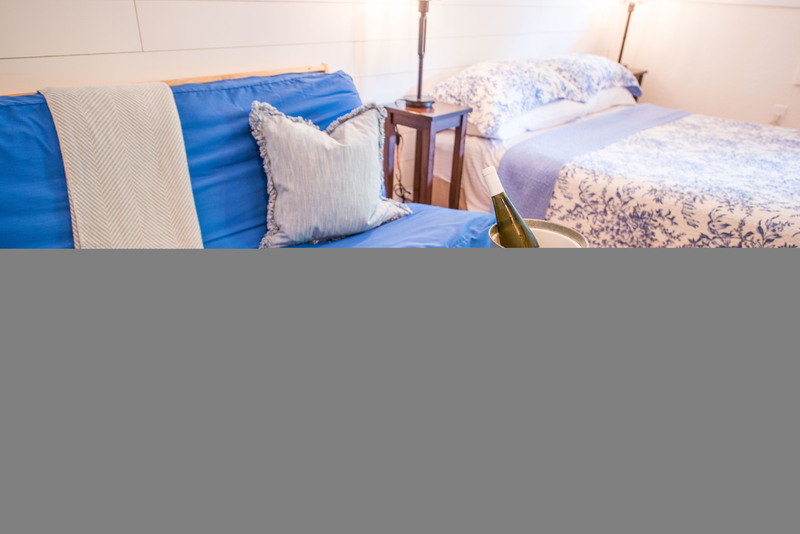 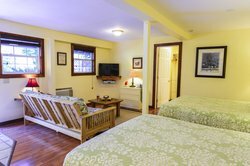 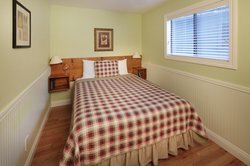 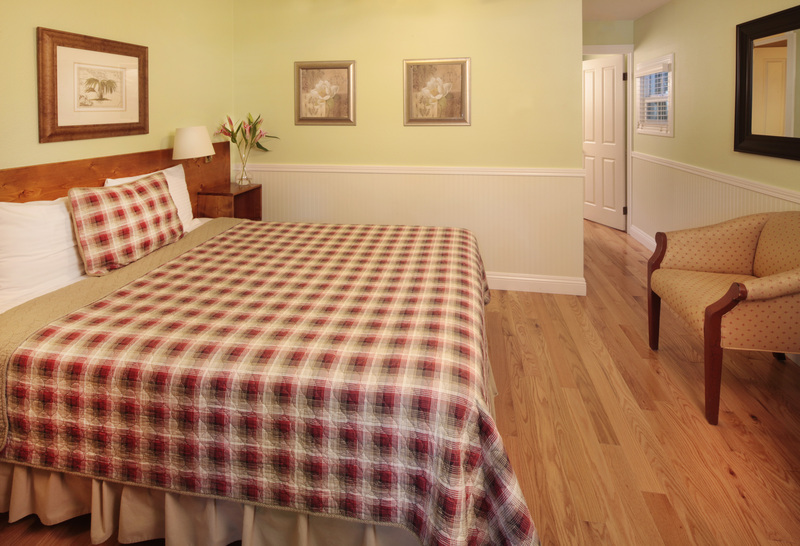 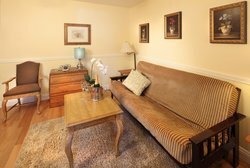 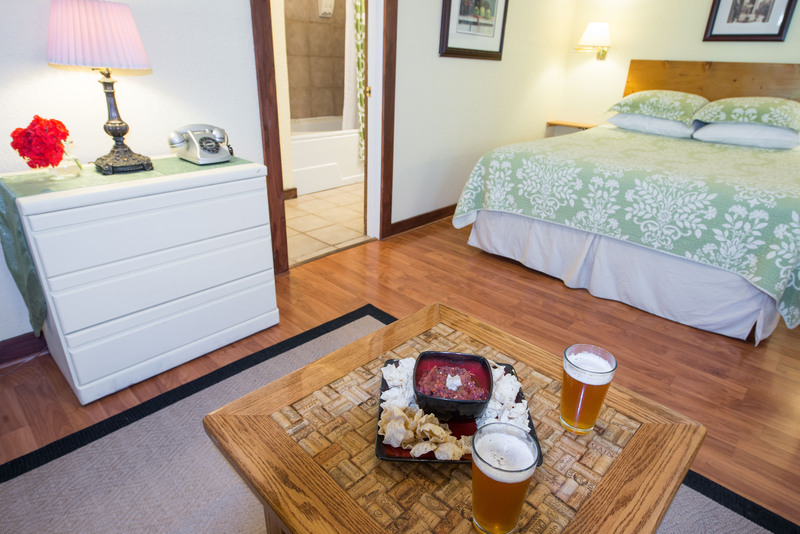 Economy Rooms: For an economical stay within steps of the Russian River, try one of our Economy Rooms. 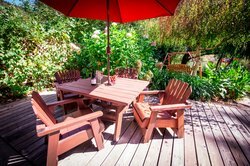 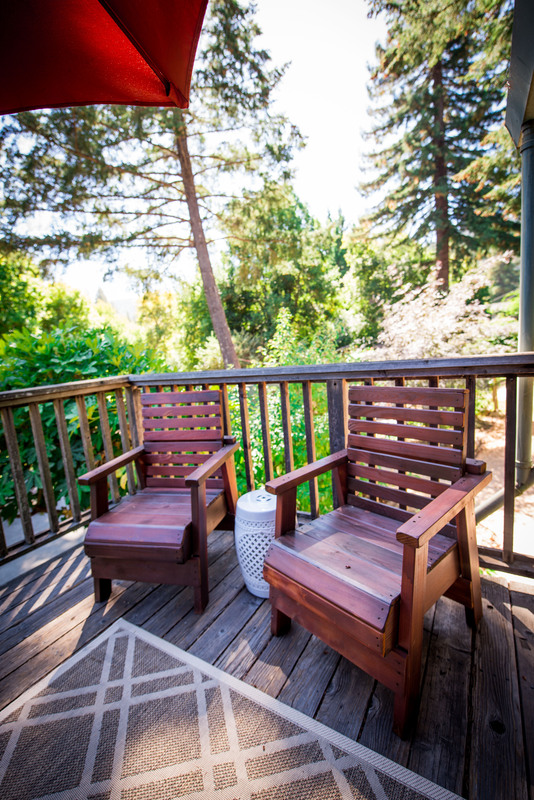 Mid-Priced River Views: Enjoy breathtaking views of the Russian River and the stunning redwood trees from our Mid-Priced River View Rooms. Large River Views: Walk down the pathway to the river and gardens where you will find our largest rooms. 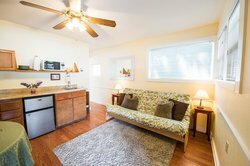 This one bedroom Kitchen Suite has two separate rooms: a bedroom in the back with a queen-sized bed and a sitting room in the front with a futon. 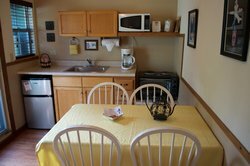 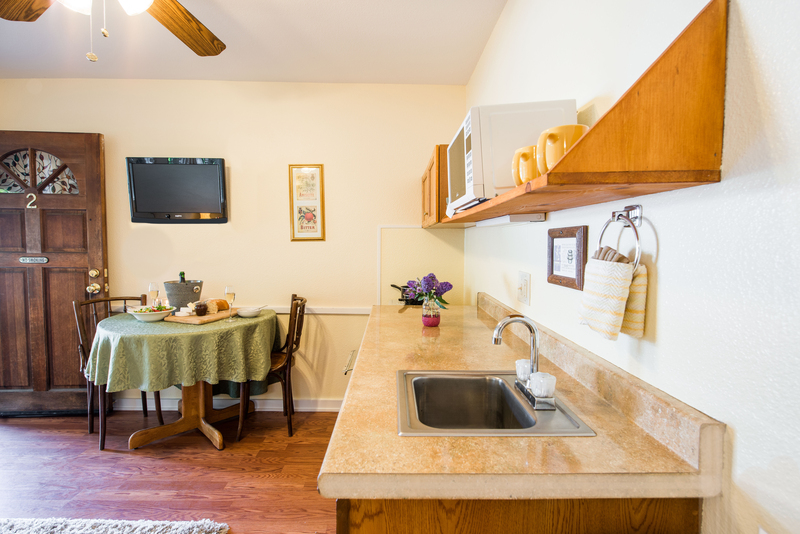 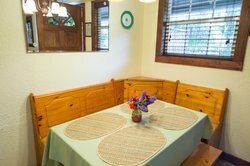 This compact unit has a fully stocked kitchen and a dining table. 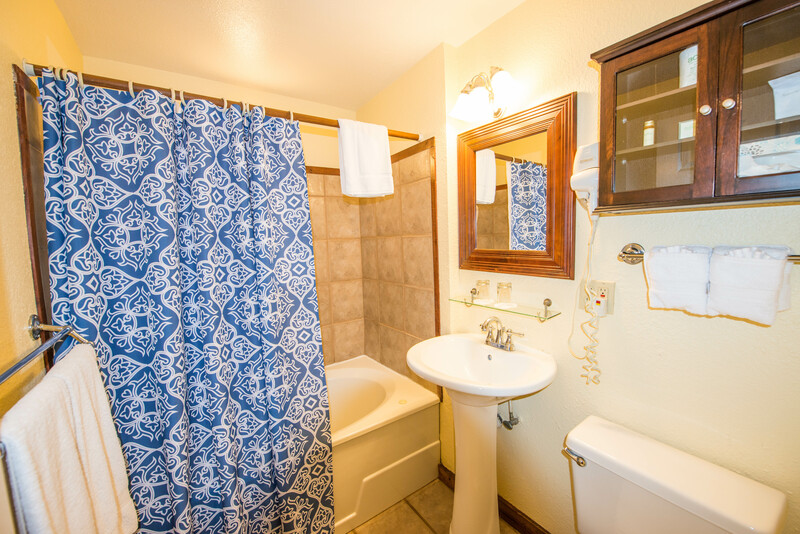 The small bathroom is equipped with a shower. 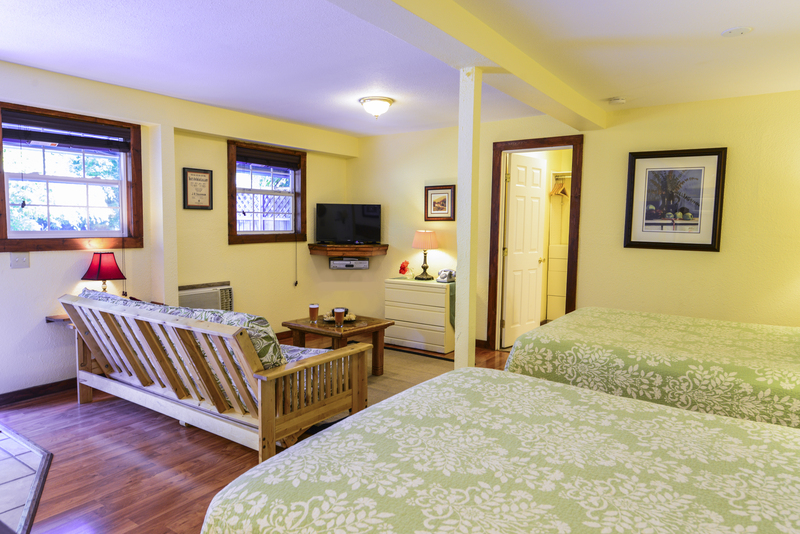 This room is pet friendly with a $25/night pet fee. 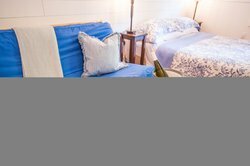 This one bedroom Villa Suite has two separate rooms: a bedroom in the back with a queen-sized bed and a sitting room in the front with a futon that is a sofa by day and a full-sized bed by night. 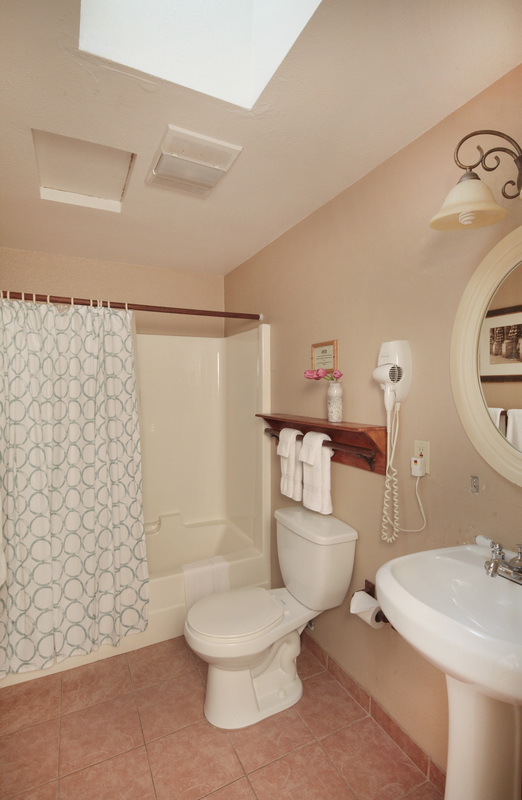 There is a large private bathroom with a standard tub/shower and all of our bathrooms come with built-in hair dryers. 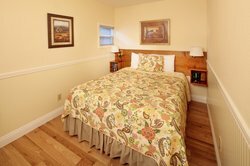 Check out all of the amenities this room has to offer below. 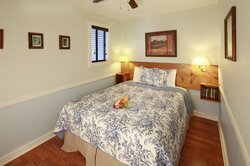 This two-bedroom Villa Suite has queen-sized beds in each bedroom with a door for privacy in between. 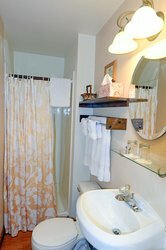 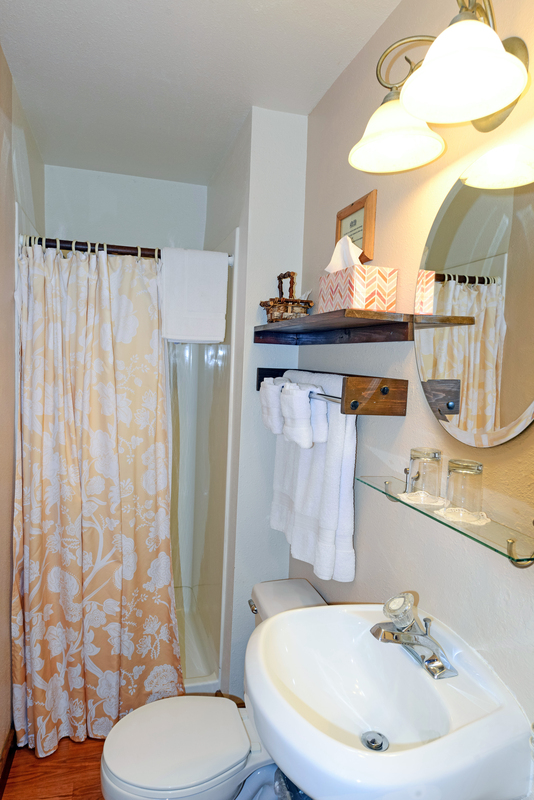 The bathroom in this unit is larger with a full-sized bathtub and shower. Hardwood floors and wainscoting add to the vintage river charm. This one bedroom suite has two separate rooms: a bedroom with a queen-sized bed in the back and a sitting room with a futon sofa/bed in the front. 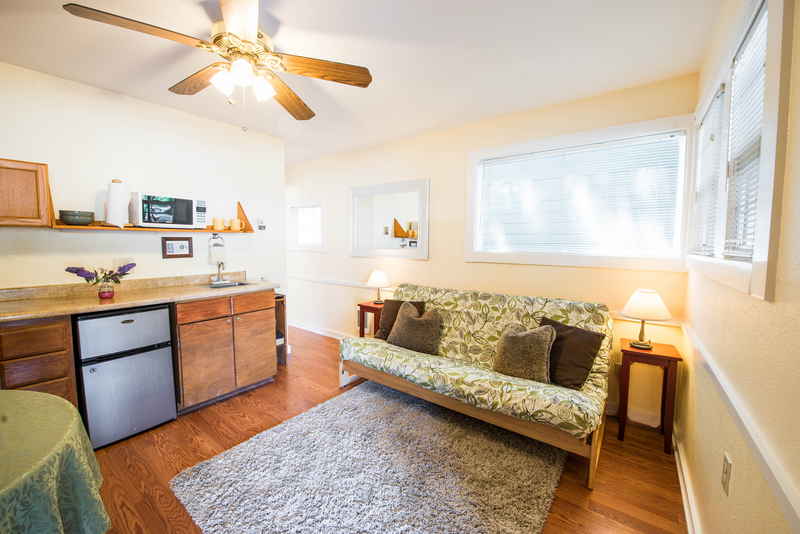 This unit is perfect for families with small children as the sitting room is a bedroom by night and space to play and relax by day. 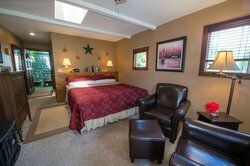 TV's (one with DVD) in each room. This two bedroom unit has a king-sized bed in the front bedroom and a queen-sized bed in the back bedroom. 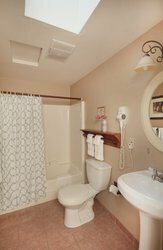 The bathroom is small with just a shower but plenty of light from the skylight above. 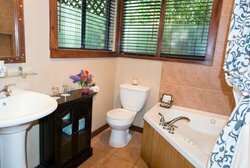 This unit happens to have a separate entrance into the back bedroom so you can come and go without disturbing whoever is in front. 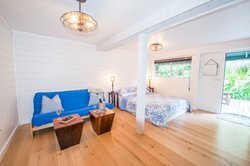 This is our very special "Romance Room" for two (no children or pets please). 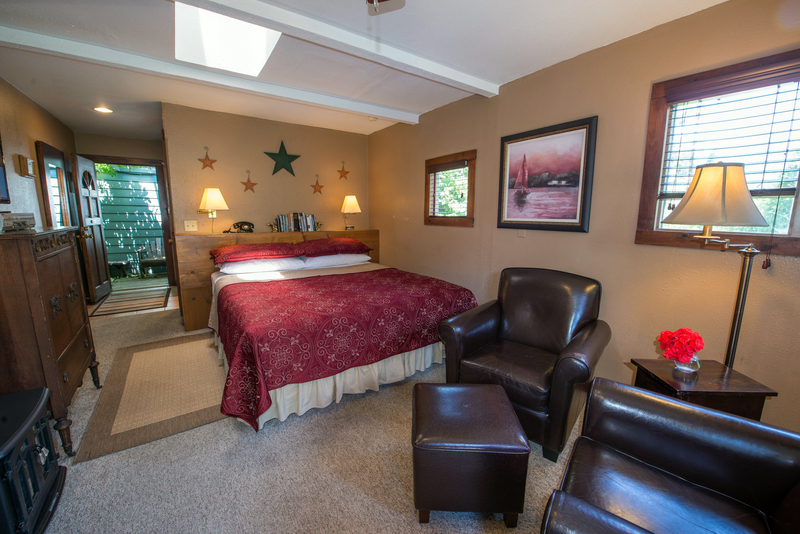 This room can accommodate up to four people in an open floor plan that overlooks the river. 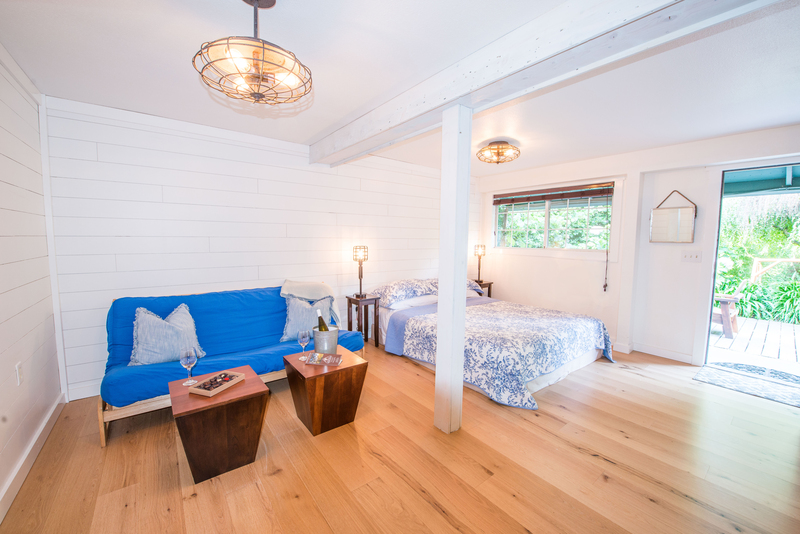 It has a queen-size bed and a futon sofa/bed. 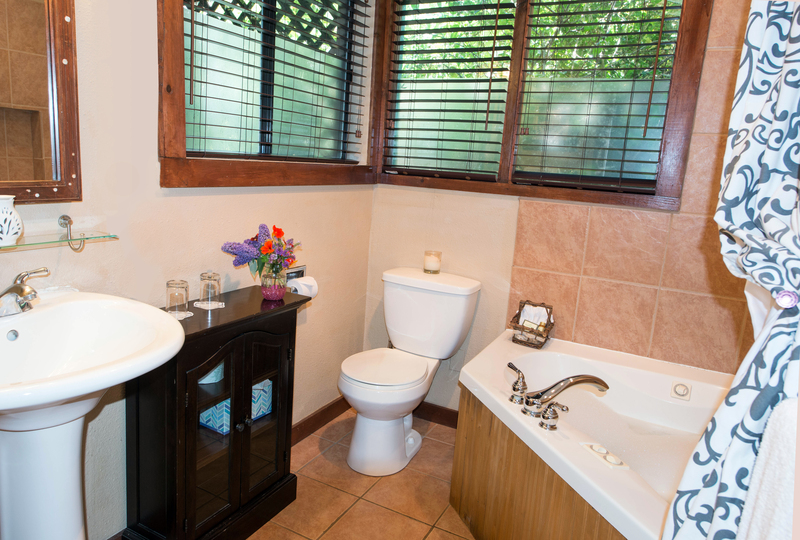 Soak in the tub then sit back and enjoy the eco-friendly fireplace. 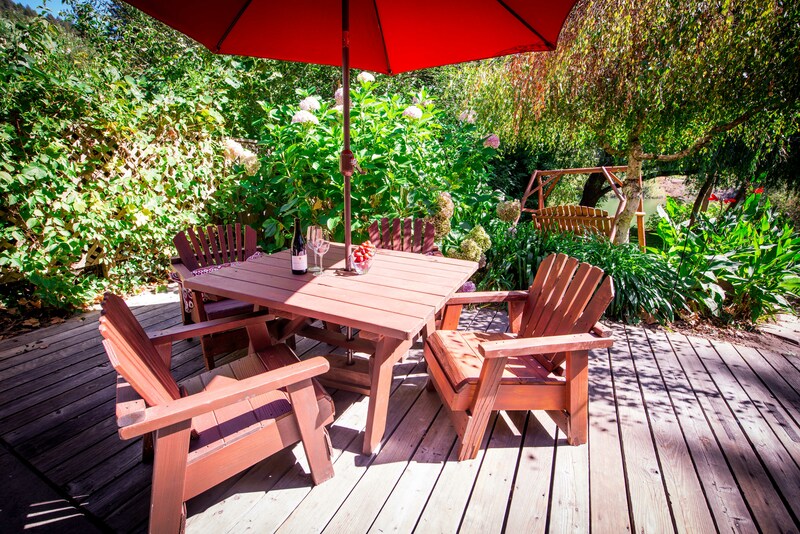 Better yet, enjoy your morning coffee or evening wine on the private balcony. There is also an adjoining door off the balcony that connects to the Kitchen Balcony Suite in the event you are traveling with a group. 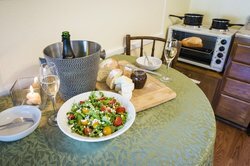 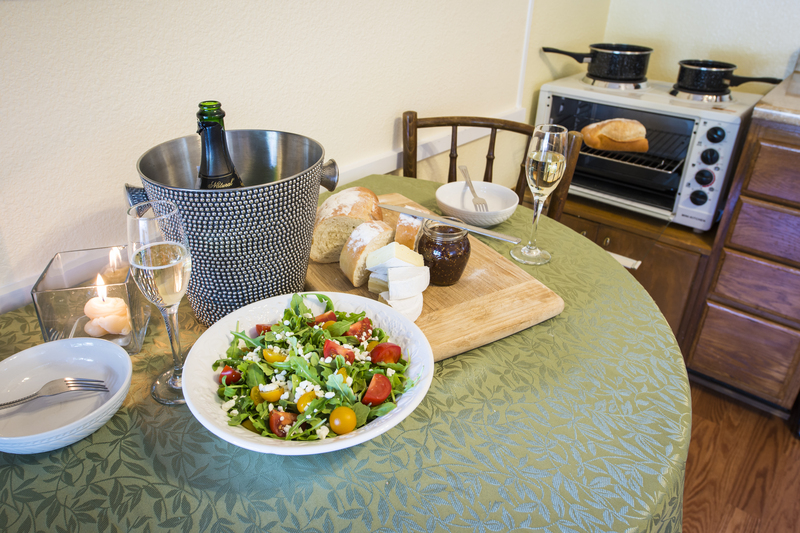 The Kitchen Balcony Suite can accommodate up to 4 people. 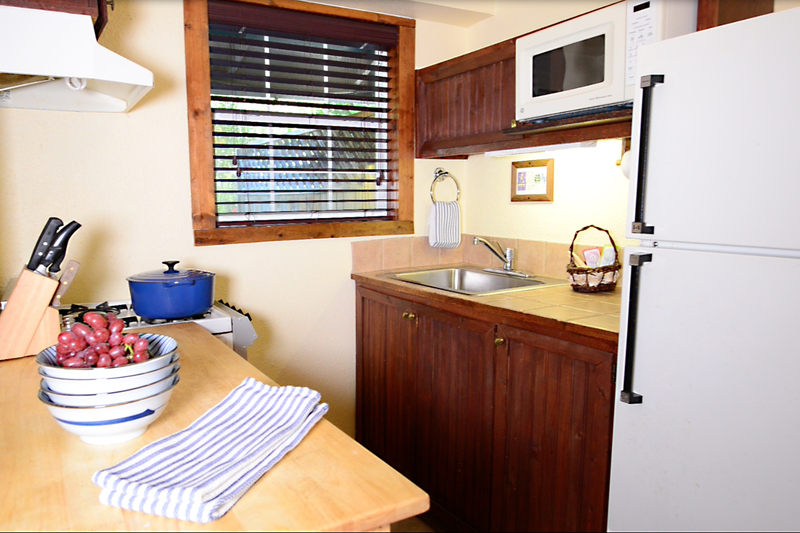 It has a queen-sized bed and a futon in the bedroom, a small bathroom, and a fully stocked kitchen. 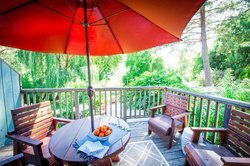 The kitchen opens onto a private balcony where you can enjoy the river and garden views from sunrise to sunset. 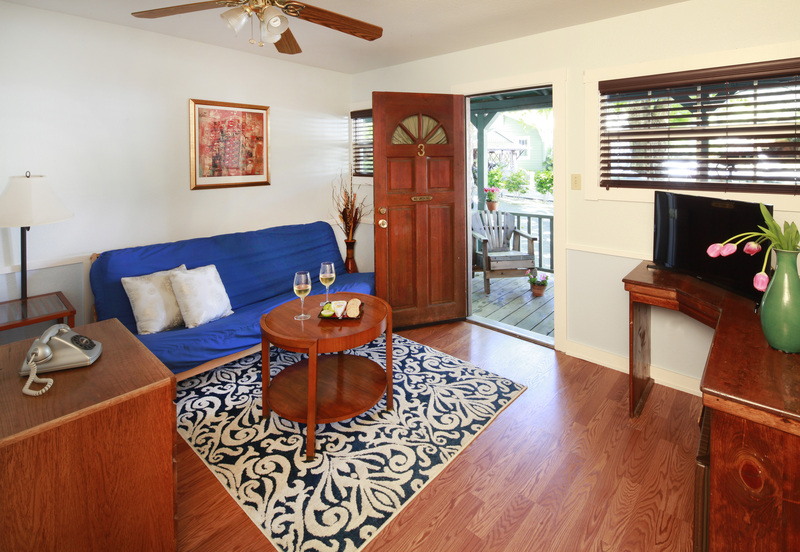 The balcony also has adjoining doors to the rooms on either side. 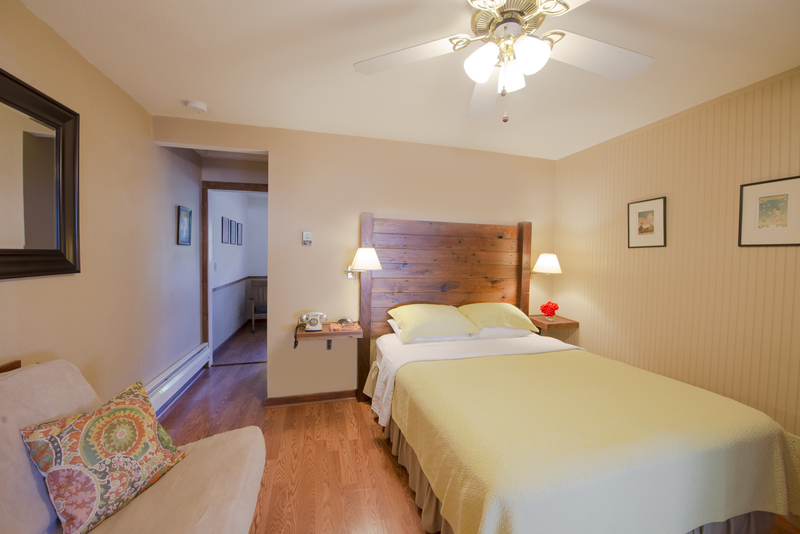 The two-bedroom balcony unit has two separate bedrooms with a king-sized bed in the front and a queen-sized bed in the back. 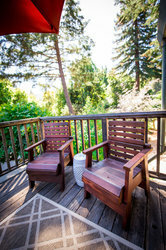 The balcony is just off the back bedroom and has one of the best views. 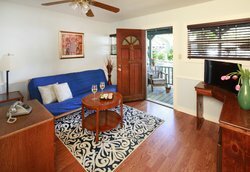 There is also an adjoining door off the balcony that connects to the Kitchen Balcony Suite. 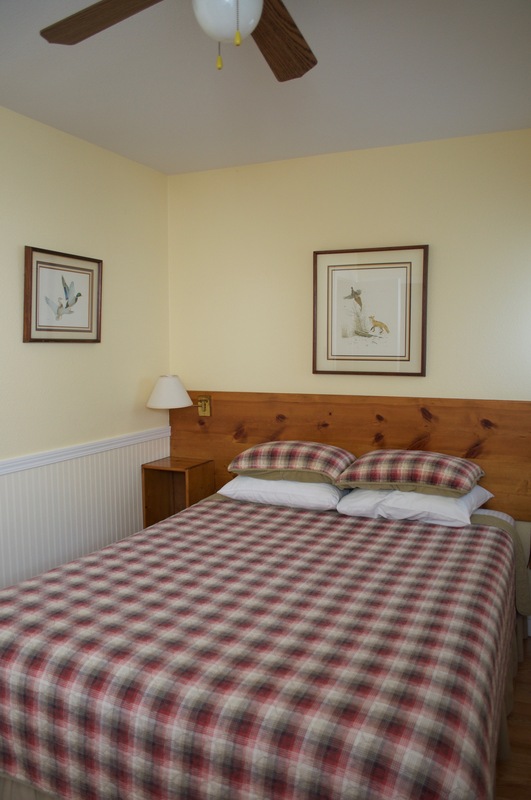 This room is pet friendly with a $25/night pet fee.